TaxACT Review – Lowest Tax Software Cost For A Reason? TaxACT is the second largest player in the DIY tax prep business behind TurboTax and just ahead of H & R Block At Home ©. But don’t let that fool you. There are vast differences between TaxAct and its competitors. While I believe this software might be a good fit for some people, it could also be a disaster for the wrong user. Let’s jump in and took a look at what the people at TaxAct really have in store for users. When you first visit the site, it’s easy to see that TaxAct is pitching to the “file my taxes for free” market. Once I selected “Learn More” under the “Start a Free Return” I discover that I can do a lot for free indeed. I can file a 1040, 1040A or a 1040EZ and just about all the schedules (A,B,C, D and much more) for free regardless of income or age. Sweet. They promise to do all this and provide 100% accuracy guarantee. If that isn’t enough, they’ll guarantee I get the maximum tax refund too. The site also tells me I can get phone support for the entire 2013 tax year for a one-time fee of $7.95. At this point, I’m starting to wonder where the catch is. I looked over the free package and it looked complete. Then I stumbled on a chart that compares the free package to the paid TaxACT offerings I did discover some differences. That comparison chart was accessible by clicking on the link at the bottom of the page. I saw that the free version does seem to deliver a lot. The paid versions provide more help, calculators and the ability to import last year’s returns as long as you use a pdf. Bueno. No real catch spotted. Whichever version you go with, the site really wants you to get started immediately. OK; so I took them up on the offer in order to take TaxACT for a test drive. Once I took the bait, I was greeted by short video that encouraged me to continue. Complete waste of time. I was hoping for some real direction. Oh well. If you opt to register, it gets a little better. Once I did the program took me to a page explaining how to maximize my experience going through the program. I really liked that. It also detailed all the data I would need in order to complete my return. This included important information about myself and family and tax documents I’ve received such as W-2s, 1099s etc. I also liked that they were trying to help me save time and be prepared. Next the software asked if I was a newbie or a returning customer. Once I admitted I was a first time user the first screen I got was a sales pitch to buy the upgrade. The only way I could move ahead was to tell them “No Thanks”. I continued on and was given the opportunity to import my prior year’s return. 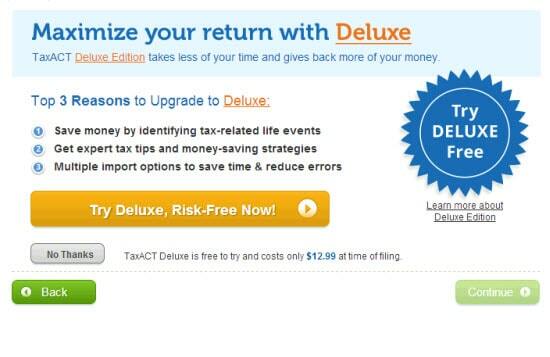 Of course if I did select that option TaxACT would have automatically upgraded (and charged me) later on. I worked through the pages and slowly uncovered a few things I liked. The questions they ask are straight-forward and they always allow me to bookmark a page if I need to come back to it. But when I got to the Filing Status I was again disappointed. If I knew my status that would be fine. But if I’m not sure, the software tells me to click on a link for IRS instructions (sorry…..I don’t read Martian) or upgrade for more guidance. They remind me a few clicks later that if I upgrade they’ll help me decide which status to use. They tell me that this help might be very valuable and could get me an even bigger tax refund. The sales pitch just doesn’t stop. Yuk. Besides these constant intrusions, the section on Basic Info was very easy to complete. Once I did complete the section, the program looks for any discrepancies and alerts me if there are any. That’s was cool. While I was in the Basic Info tab, I jumped around to different places on the navigation bar. That was simple and it was reassuring. I liked the fact that I could move around and then come back to where I had been without starting again. Of course in order to have my worked saved I had registered as a user before I started. The next section is Life Events. This area tries to identify any significant event that could impact your tax reporting. You can see from the menu above, the choices are pretty extensive. Once you click on any life event, the easy-to-understand dialogue box walks you through how to report on any event that is applicable. With the free version, you have access to the Financial Hard Times plus one more life event. If you need access to more than that, you’ll need to upgrade. Are you surprised? Once I completed the Life Events section, it was time to start the Federal Q&A. In this section, the software will ask about your income, deductions, credits, taxes and other miscellaneous items. I hate to sound like a broken record but before I got 2 clicks deep into the section, another ad comes up trying to sell me the upgrade. But at least once I got over that nuisance, the program started to play nice. I completed the income section and then the software showed me a review of my inputs and offered me a chance to review and correct. In each income area, TaxAct offers a quick entry or step-by-step guidance to help me get the right data into the program in a time efficient manner. I like that. After you complete the taxes section you are left with the miscellaneous section. As expected, it was complete. When you finish the miscellaneous section you are given a summary of your Federal return. If you see something you don’t like you can go back and review. What I liked about this is that you have the option of either going through each section step-by-step or going to individual areas you want to work on. If you want to see how the 1040 is going to look, you have that option as well. And if you are ready to go on to the next section you will start working on your state tax return. Once you finish the State return you have another chance to review your return before you file. When you are ready to file, you simply select that option. 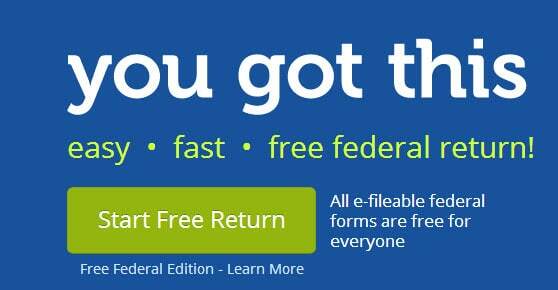 You can either E-file or print and mail your return. After you file, you can go to the “Next Year” section. This area helps you plan W-4 withholding for the coming year. You can also test what-if scenarios to see what changes you might make depending on potential changes in your situation for the upcoming year. In this area you can also provide feedback on how to make TaxAct a better product. I appreciate that. Shortly after you file you should get two different emails from TaxACT. The first will tell you that the return was transmitted and the second tells you if the IRS or state accepted your return. 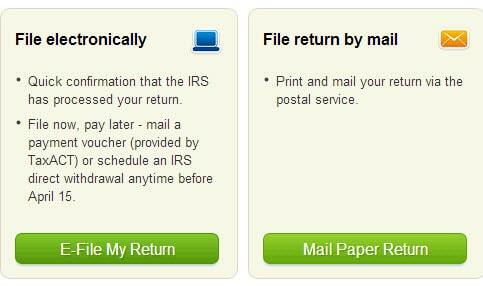 After you file your return, you can check the status of your refund on the IRS website. You can also call the IRS hotline. You get a lot for the free version but you have to pay $17.99 for state filing. The deluxe version is $12.99 plus $5 for the state filing. The ultimate bundle version is $17.99 and includes free phone support. If you do the math, you see that if you are going to file a state return, you might as well go for the ultimate bundle. If you are interested in downloading the software or buying the disc the prices are a little higher. The free version charges another $14.99 for the state return. The deluxe version is $12.99 plus $9 for the state return. The ultimate bundles range from $17.99 to $28.99. If you have questions you can call in for help. During tax season you can call in from 7AM to 9 PM (CST) Monday through Friday. ON Saturday you can call in from 8AM to 6 PM (CST) and on Sunday you can call between 10 AM and 5 PM. During the off season you can call in from 8 AM through 5 PM (CST). They also have some pretty handy other support tools like an extensive library of popular help topics. If you buy the deluxe or bundled version, you also have access to their TaxTutor Guidance and unlimited phone support. If you go with the free version, you do not have access to the TaxTutor section but for $7.95 you can call in with as many questions as you like. You have to like the pricing of TaxACT. It is by far the low-cost provider in the market hands down. You can really do a lot with the free version. I was surprised and impressed. If you know what you are doing and your return is uncomplicated, you could easily use the product and save yourself enough money to go out to see a fun movie. Not bad. The program helps you get organized before you start the process by telling you exactly which documents you’ll need. That’s smart. The screens are easy to go through and it’s a snap to go back and forth between sections without losing your work as long as you register before you start. The “Life Events” section is very helpful. I think the menu just might remind users about significant happenings that they may otherwise overlook. Users have the option of using step-by-step instructions or going directly to the section they want to work on. I find that useful. You already know what my number one beef with TaxACT is. The constant upselling. It’s almost insulting. Sheesh. What I don’t understand is why they do it. If you refer back to the pricing, it costs about the same to use the “free” version as it does to use the deluxe or the bundled version assuming you have to file a state return (and who doesn’t?). My second beef is related to the first. Their entire pricing structure is all about perception rather than substance since the cost is identical. That made me feel like they are trying to get one over on me. I don’t like that at all. Who does? Next, somewhere on the site they told me that people who go with the free version can purchase live phone support for a one-time fee of $7.95. But I didn’t find anywhere to actually make that purchase. Disappointing. Speaking of support, I have doubts about it when it comes to TaxAct. I didn’t call support with a tax question but I read scores of reviews raking TaxAct support over the coals. I didn’t see any criticism of the advice per se. The big complaint was the pricing structure of the support. While the free version states that you can pay a one-time fee for service, the reviews I read stated TaxAct charged users every time they called in. It’s possible that the service pricing has changed since those complaints were lodged of course. Just the same, from what I read in user reviews and the fact that it’s impossible to find more information on buying support for the free version, I wouldn’t count on getting great support. When you send in your tax return you have a lot on the line. The last thing you want besides contracting Typhoid Fever is a problem with the IRS. That being said, don’t use TaxAct if you need tax help or you have a complicated situation. You might save a few bucks but is it worth taking the chance of being thrown in the Octagon with the IRS? I don’t think so. If you need help, go with H&R Block or TurboTax. I would only use this product if I really knew what I was doing and didn’t need any expert guidance or help. Sorry TaxACT. Here’s a dime. Call me when you get your support act together.